Kale has been labelled one of the superfoods of this decade. I always find it interesting how certain foods can be around for so long and then something happens all of a sudden to give it ‘superfood’ status. Kale has always been healthy for you (it’s a dark green vegetable packed with beta carotene, potassium, calcium, vitamin K, vitamin C, lutein and zeaxanthin). However, I have to admit that I never really cooked it that often. I would usually see it in soups and stews but then kale chips became popular and everything changed. I vividly remember the first time I had a kale chip. It was at a nice French restaurant called Auberge du Pommier where they deep fried kale leaves to make them into a kale chips. I vaguely remember the main course being filet mignon but the vegetables (including the kale) stole the show. I love the fact that cooks are doing such amazing things with vegetables these days. They are no longer just a side kick on the plate next to the meat. This got me curious about kale. I have been wanting to try cooking it but wasn’t sure how best to prepare it. However, I saw a recipe for kale chips a couple months ago and really wanted to try it. 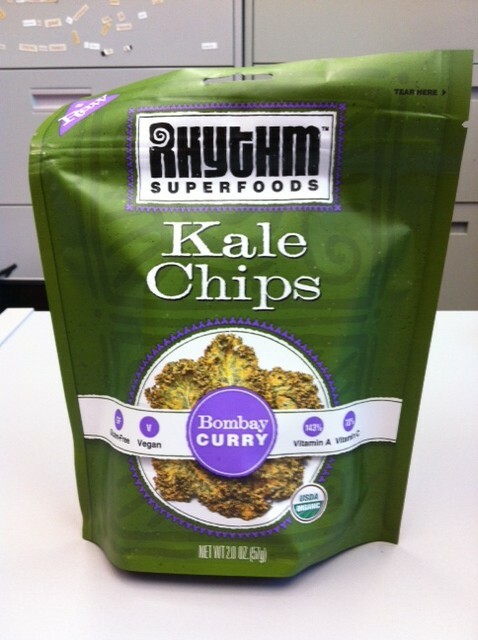 Another thing that motivated me further was that I saw commercially prepared bags of kale chips (by Rhythm Superfoods) being sold at my local grocery store (for $6.99/bag – what a rip off). Considering that you can buy kale for $3/bunch that is a crazy mark up! That being said, I’m a sucker when things involve a taste test. I figure that this one should be easy. There are five different flavours that Rhythm Superfoods Kale Chips come in: Kool Ranch, Bombay Curry, Zesty Nacho, Texas BBQ and Mango Habanero. Seeing that they go for $7/bag I only bought one – Bombay Curry which happens to be one of the two flavours that are available at my local grocery store. The recipe for making homemade kale chips is quite easy. I adapted the recipe from a fashion/beauty website that I follow – Chickadvisor.com. Here is a link to the original recipe which has great photos of the entire process and inspired me to give it a try. I have adapted the recipe to make it even simpler (hey, I’m making kale – that’s already a big step on my part). Take each stalk of kale and cut away the center stalk (this part is very tough) so you just have the leafy green part. Tear or cut the leaves into bite sized pieces. Place the leaves in a large bowl and drizzle with olive oil. Mix the leaves with your hands to ensure they are evenly coated. (You can also use a spray bottle to evenly distribute the olive oil which is probably even better). Place the kale in a single layer on a baking sheet. Sprinkle lightly with salt and pepper. Place in the oven for 5-10 minutes until the kale is crispy and just starting to brown. Please try the store bought kale chips and the homemade kale chips. Please comment on the taste and appearance of each one. What do you think of the seasoning on the commercially packaged ones? The homemade ones? Which one do you like more? Would you buy kale chips for $7/bag or would you make your own? When I opened up the packaged kale chips, the first thing I noticed was the small silica gel pack inside. This is definitely a far cry from the homemade kale chips that I baked off in the toaster oven. 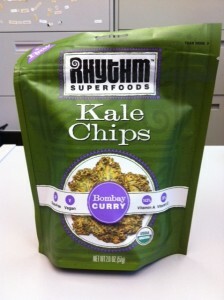 The store bought chips were in large clumps and heavily seasoned which overpowered the taste of the kale. Everyone thought that the taste on these was way too overpowering and didn’t like them at all. And at $7/bag – it definitely isn’t worth it. I’m glad I bought only one. Kale chips are super easy, take hardly any time and the ingredients are super cheap to buy. And they taste way better when you make them yourself. This one wasn’t a hard decision. Homemade is totally the way to go! The packaged kale chips were such a disappointment! Over-seasoned and clumped together, these chips were not visually appealing and they had an over-powering taste. The homemade ones were surprisingly light, crunchy and tasty. Homemade: I really like kale prepared this way because it doesn’t taste as bitter. And I love the crispy, light texture of the baked leaves. Storebought: Okay these are gross. The taste is overpowering and all I taste is a super strong curry taste. I can’t even taste the kale. The texture is also heavy with big clumps whereas the homemade are individual leaves. I would never buy this. Homemade is the way to go! 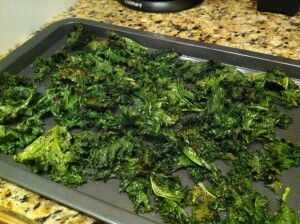 Homemade kale chips: AWESOME! Soft, not too crispy (which is the only downfall because you expect chips to be crispy and crunchy) but taste is very good! I love the dark green color of them! 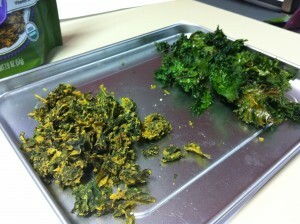 Curry kale chips: Very crunchy but that’s about it! Maybe because of the curry flavor, the appearance doesn’t look as fresh and the curry flavor is soooo strong it takes over the kale flavor. I loved the homemade kale chips! Surprisingly light and crispy. Very fine and delicate in texture as well. Weren’t greasy… I could definitely see myself chowing down on these. I’ve had store-bought kale chips before, but these weren’t how I remembered them. The biggest turn off was the seasonings. Too overpowering. Also, the texture of the chips, though also crunchy, was much harder, and the kale leaves seemed stuck together… clumpy even, leaving you with an awkwardly hard and over-seasoned mass to chew through. The price of these kale chips was also ridiculous. I would not pay this price – even if they were delicious. I’d definitely attempt making them at home. Thanks Lisa!